Avening’s Pig Face Day. 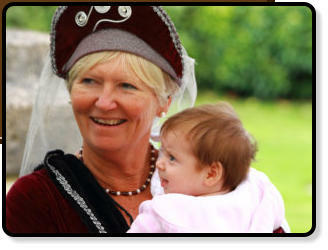 We are indebted to Queen Matilda, the wife of King William the Conqueror, for this celebration. Barely more than four foot tall, she was the smallest Queen of England; it was rumoured that she was involved in the commissioning of the Bayeux tapestry, which was quite possible as it was completed by English needlewomen, probably nuns, to celebrate William’s success in ousting Harold at the Battle of Hastings in 1066. She was also responsible for the building of the Abbaye aux Dames in Caen, which is where her crypt and tomb can be found. And curiously she also had connections with Avening. King William returned to France in 1067, a year after the Norman invasion, and he eventually died in a riding accident in 1086. However, Queen Matilda remained in England, and fell in love with Brictric, the Saxon lord of the Avening estate. Unfortunately for Brictric, he did not return her love, and Matilda was so devastated by his lack of interest in her that she had him thrown in a dungeon, where he subsequently died. However, when Queen Matilda eventually realised how badly she had behaved, she gave the village a church as a way of repentance, and so it was that the Church of the Holy Cross was built at Avening in 1080. 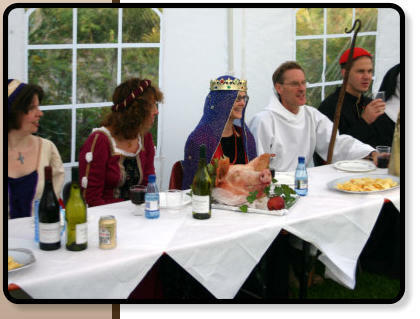 A feast was organised in celebration of this event, which over the years has become formally known as the Avening Feast and Queen Matilda’s Pageant. The feast usually takes place on the first Sunday after 14th September, and is currently celebrated every other year, usually after Evensong. 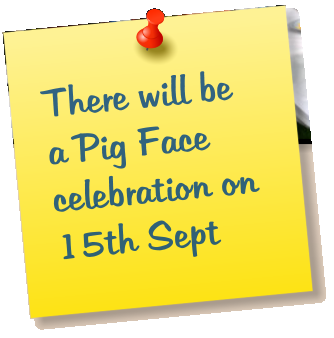 As the head of a pig is taken into the church as part of the procession and adorns the top table, this is probably why it has become known as Pig Face Day. 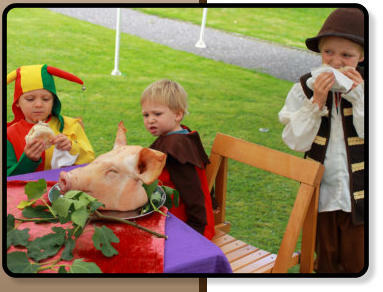 Apparently, in 1685 the Rector George Bull was forced to suppress some abuses connected with this feast, but nowadays it is conducted with complete decorum; villagers dress up in the costumes of the day and play out the pageant, while spectators are treated to a sumptuous pig roast. 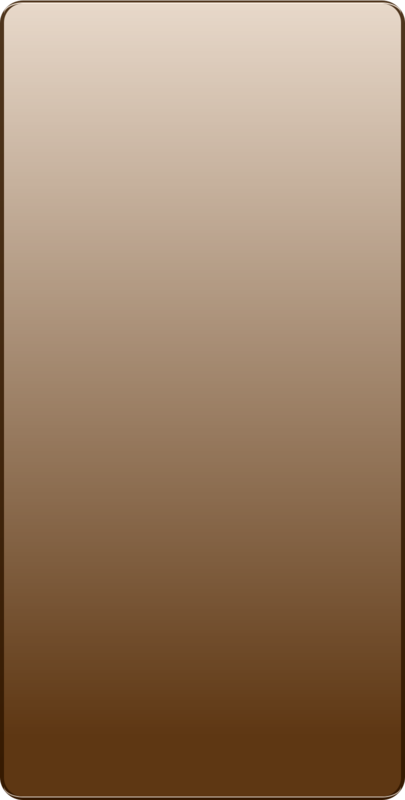 Queen Matilda’s Pageant. 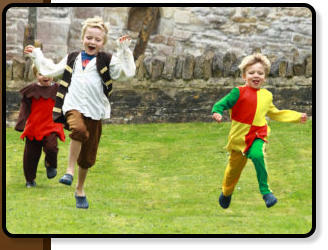 We are indebted to Queen Matilda, the wife of King William the Conqueror, for this celebration. Barely more than four foot tall, she was the smallest Queen of England; it was rumoured that she was involved in the commissioning of the Bayeux tapestry, which was quite possible as it was completed by English needlewomen, probably nuns, to celebrate William’s success in ousting Harold at the Battle of Hastings in 1066. She was also responsible for the building of the Abbaye aux Dames in Caen, which is where her crypt and tomb can be found. And curiously she also had connections with Avening. King William returned to France in 1067, a year after the Norman invasion, and he eventually died in a riding accident in 1086. However, Queen Matilda remained in England, and fell in love with Brictric, the Saxon lord of the Avening estate. Unfortunately for Brictric, he did not return her love, and Matilda was so devastated by his lack of interest in her that she had him thrown in a dungeon, where he subsequently died. However, when Queen Matilda eventually realised how badly she had behaved, she gave the village a church as a way of repentance, and so it was that the Church of the Holy Cross was built at Avening in 1080. 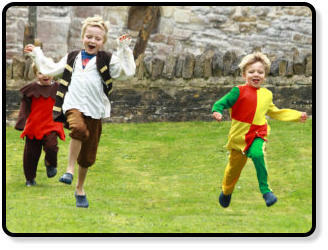 A feast was organised in celebration of this event, which over the years has become formally known as the Avening Feast and Queen Matilda’s Pageant. The feast usually takes place on the first Sunday after 14th September, and is currently celebrated every other year, usually after Evensong. 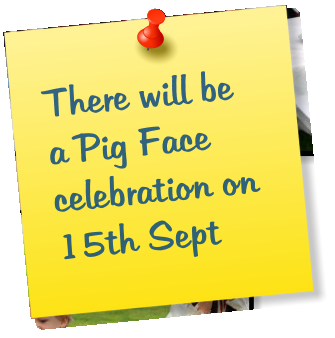 As the head of a pig is taken into the church as part of the procession and adorns the top table, this is probably why it has become known as Pig Face Day. 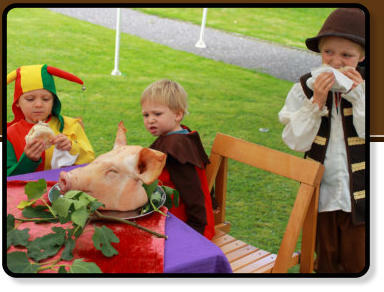 Apparently, in 1685 the Rector George Bull was forced to suppress some abuses connected with this feast, but nowadays it is conducted with complete decorum; villagers dress up in the costumes of the day and play out the pageant, while spectators are treated to a sumptuous pig roast.